College Supply Packages: They Do It All! So many supplies, so little time. Shopping for college supplies can be stressful. There are so many essential dorm products you need to have to in your dorm room that it can be easy to forget the little and big college things. If only there were a way to get all of your most important college supplies quickly and easily...Luckily, there is! Our college supply packages simplify your college shopping process by bundling all of your must-have college essentials in one package. So stop stressing and start shopping! One Stop Shop. Doing laundry in college is one of those things that every college student has to do. Whether you like it or not. One way to make doing laundry in college much easier is to add our One More Day Set to your college laundry supplies. 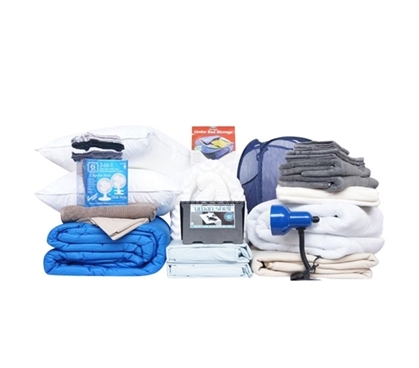 With this college supply package, you'll have everything you need to tackle the dorm laundry room. Our pack includes a laundry bag with printed instructions, a lint roller, a stain-out pen, and detergent. Our One More Day set does everything for you—except your actual laundry. Stay healthy, Stay happy. With so many college students crammed into one dorm building, someone is bound to get hurt. 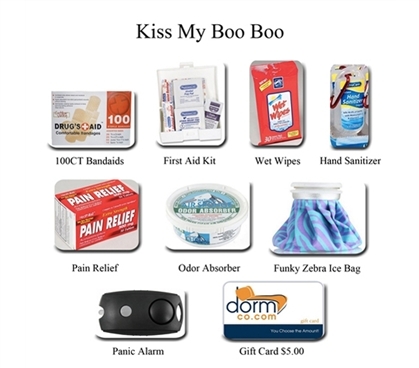 With our Kiss My Boo Boo in your college supplies, that person doesn't have to be you. And if it is you, you'll be all set to take care of it! Our first aid college gift pack has the necessary supplies to treat minor scrapes and cuts, ice sore muscles, and even sanitize your dorm room! College Bedding: Complete. Having a comfy, cozy bed in your college dorm room is so important. Universities may provide you with beds, but they sure aren't comfortable. 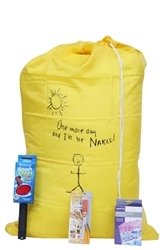 Getting a comfy dorm bed is easy with our DormCo College Dorm Package #3 Fully Loaded Pack. We know that college dorm room beds are like snowflakes, no two are the same. That's why you can customize our dorm bedding package by choosing which type and color of twin xl sheets and comforter you'd like. Our package also includes a mattress pad and egg crate topper that will make your dorm bed as soft as possible. Our dorm bedding package proves that shopping for college bedding supplies doesn't have to be complicated.